Small Batch Almond Raspberry Cakes. 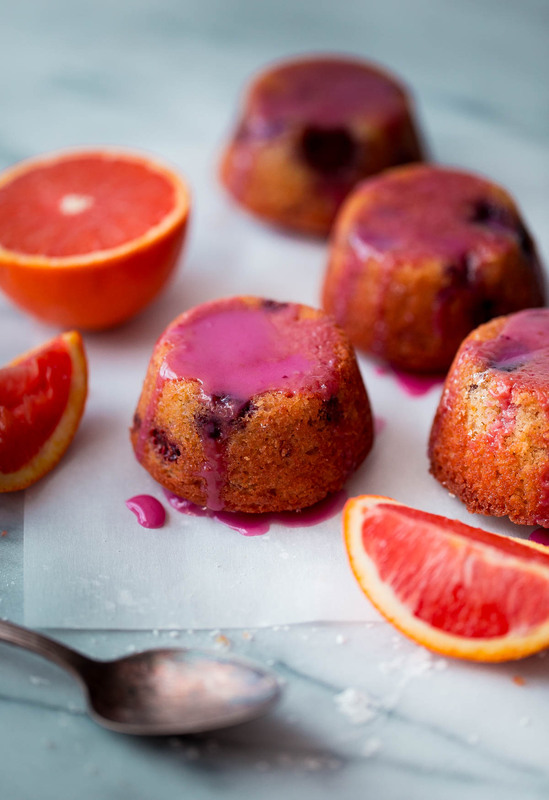 This small batch recipe makes just four mini cakes, perfect for Valentine’s Day or any occasion when you don’t need a massive cake lying around tempting you to eat it. We’re talking cake today! Mini almond raspberry cakes. One small batch (four, to be precise) of itsy bitsy teeny tiny cakes. Just enough cake to make for your special someone on Valentine’s Day next week, but not too much cake that you end up accidentally eating your weight in it. I’ve got your back. 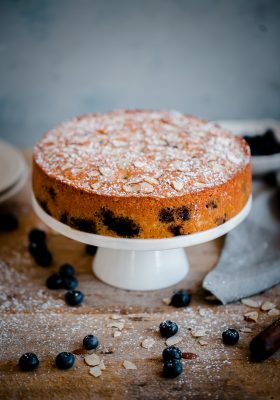 While I was brainstorming recipe ideas, I happened to revisit a recent favorite: this blueberry almond tea cake. Upon doing so, I quickly realized it was perfect for scaling down into a small-batch dessert. Let’s face it, some desserts are not made for scaling down. Measurements can wind up extremely wonky (I’d rather not measure out a tablespoon of beaten egg, thanks) or special equipment is needed. These little cakelets are an exception. You just need a standard muffin tin. 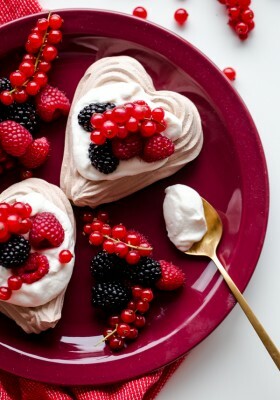 They might not be quite as festive as these chocolate heart meringue cups, but they are just as tasty and cute! They are also extremely low-maintenance, easy to prepare, and perfect for all occasions. Oh, and they’re made with almond and whole wheat flour too, so you can feel pretty good about them. Like so many others, my brain automatically dwells on chocolate desserts whenever I think about Valentine’s Day. But I really wanted this dessert to be multi-purpose and appropriate for everyone. You know, even those of us who aren’t that into this particular holiday. Confession: I’m one of those people. Oops! The type of cake that would be appropriate for brunch, tea, or as a casual after dinner treat. So instead of sticking with chocolate (these chocolate rochers or chocolate beet bundt cake would be a great alternative option, if you prefer chocolate! ), I took a departure and went a bit lighter this year. These almond raspberry cakes are buttery, full of almond flavor, and have a delicate crumb. 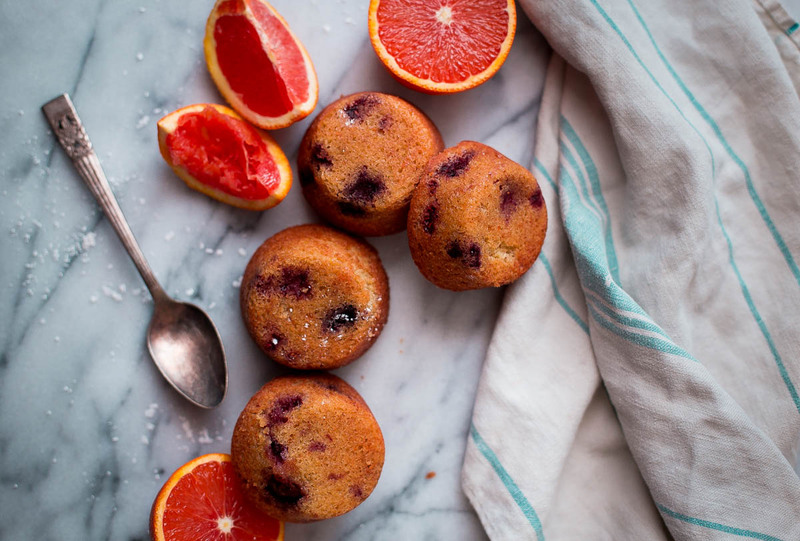 For a pop of color, I wanted to incorporate berries and some of that beautiful winter citrus that I love so much. These almond raspberry cakes use frozen raspberries for maximum ease, and are infused with fresh orange zest. 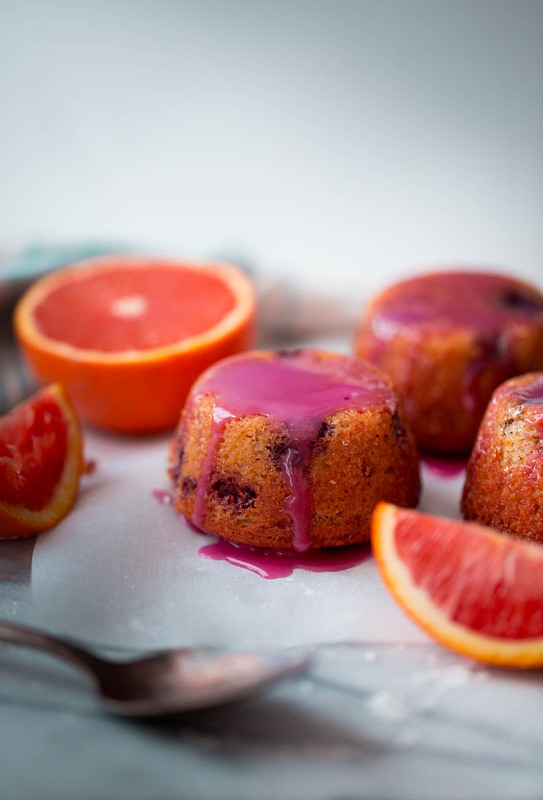 They are topped with a naturally pink orange glaze! Be still my heart. Let’s talk about that glaze! Because I have a feeling that’s what most of you are most curious about. I was dead set on making a naturally colored glaze for these little cakes. 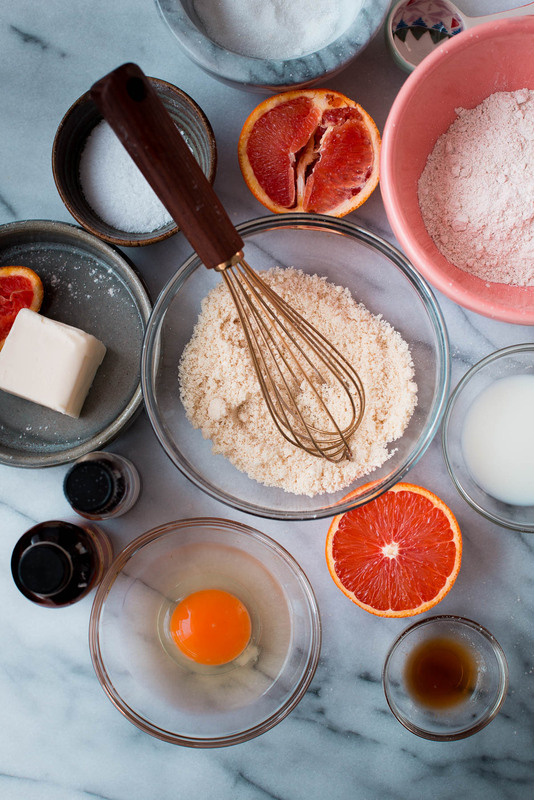 There are a few ways to make naturally pink glazes for cakes and other desserts. The easiest way to do so is to turn to nature, and think about what fruits and vegetables fall into that color category. 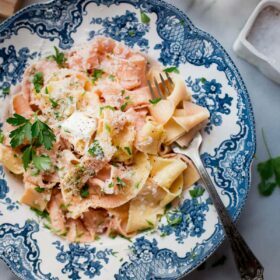 The juice of blood oranges is perfect for this, but is largely dependent on whatever blood orange you happen to get your hands on. 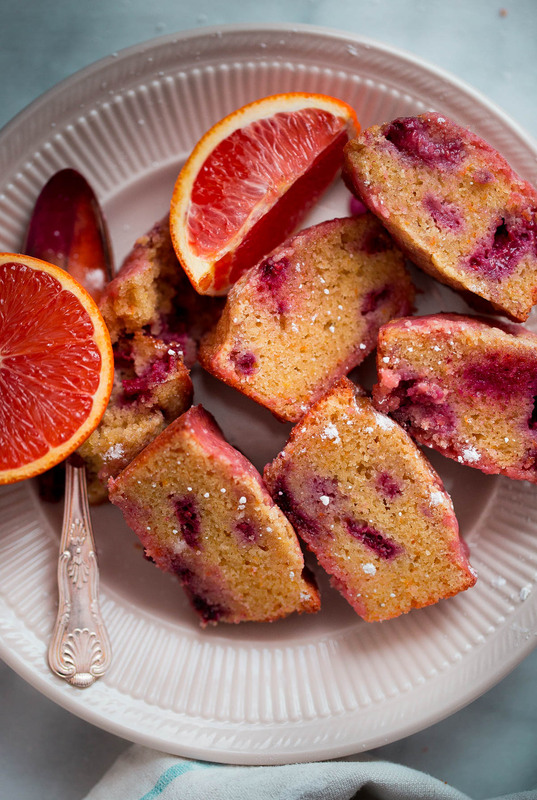 Some blood oranges (ok, a lot) are not dark enough in color to produce a super pink glaze. I couldn’t find any this time around. 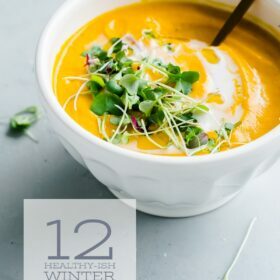 The next best alternative is to use dehydrated powder or puree. Jam is another last minute option, but the color will be fairly muted. You know those freeze-dried fruits or vegetables? They are the easiest way to infuse a strong pop of natural color, because they tend to be readily available. 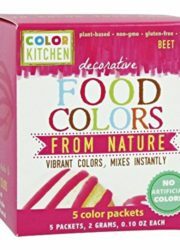 I happened to come across this natural coloring powder at Whole Foods and quickly realized it was just fancily disguised beet powder! If you happened to check out this year’s Halloween-themed beet bundt cake, you know how powerful beets are as a coloring agent. Conclusion? It worked wonderfully. I used a few pinches of beet powder and the simple powdered sugar glaze turned into the most perfect shade of pink ever. I loved it. If you hate beets, you will not taste the beet powder, promise. 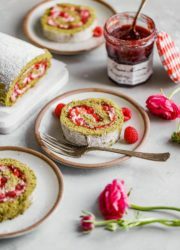 Dehydrated raspberries, ground and sifted into a fine powder, would be great option for these cakes. To make these more ‘cake-like’, I chose not to line the muffin tin with papers. If you do this, be sure to generously grease your muffin pan with butter or baking spray. 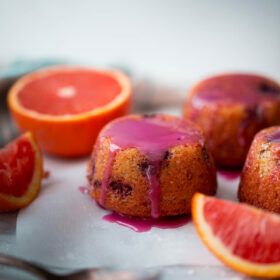 To make them a bit different, I served and glazed them bottom-side up, which gives them more of a cake-like appearance! Cheers to small batch desserts. Prepare the cakes: Preheat the oven to 325 degrees Fahrenheit (162 C) with a rack in the center position. Generously grease four center-positioned wells of a standard 12-cup muffin tin with butter or baking spray (or line them with four muffin liners). In a small mixing bowl, whisk together the whole wheat pastry flour, almond flour, baking powder, and salt. Reserve one teaspoon of the flour mixture to toss with the frozen raspberries. Set aside. In a medium mixing bowl, combine the sugar and orange zest. 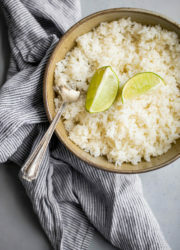 Using your fingertips, rub the zest into the granulated sugar until fragrant and moist. Add the softened butter, almond extract, and vanilla extract. Using a hand-held mixer (or a stand mixer fitted with a paddle attachment) cream the butter and sugar mixture over medium-high speed until light and fluffy, about 3 to 4 minutes. 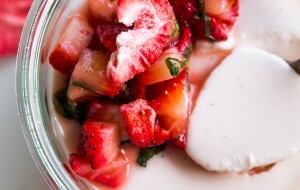 Scrape down the bowl several times to ensure all of the ingredients are incorporated evenly. Reduce the speed to medium and add the egg. Beat until incorporated (it may look slightly broken). Over low speed, slowly add the flour mixture in two additions, alternating with the milk until just combined. The batter will be relatively thick. Toss the reserved teaspoon of flour mixture with the frozen raspberries. Using a spatula, gently fold the raspberries into the batter. 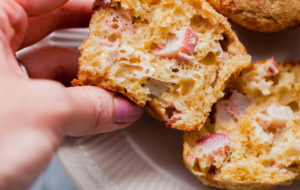 Using a spoon, transfer the batter evenly into the four greased muffin wells, and smooth the top with the bottom of the spoon. Bake at 325 degrees (162 C) for 26 to 28 minutes, or until the cake is golden brown and beginning to pull away from the sides. A toothpick inserted in the center should come out clean. 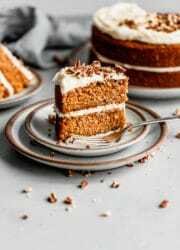 Allow the cakes to cool in the pan on a wire rack for 5 to 8 minutes. 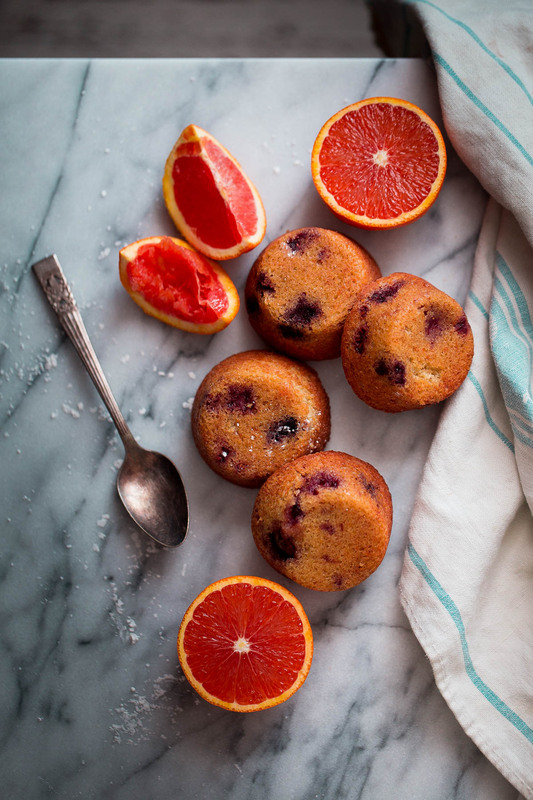 Using a knife, gently run along the sides of the muffin wells to release the sides of the cakes. Carefully invert the muffins onto the wire rack (*keep the cakes top-side down) and cool completely. Prepare the Glaze: Whisk together the powdered sugar, orange juice, and beet powder/coloring (if using) in a small bowl. The glaze should be thick, but be able to drizzle from the end of a spoon. If it is too thin, add additional powder sugar. If too thick, add another drop or two of orange juice. Spoon the glaze over the tops of the cakes (*I served the cakes top-side down to have them be more cake-like in appearance). Adapted from my blueberry almond tea cake. If your frozen raspberries are very large in size, break them apart into slightly small pieces before folding them into the batter. They will distribute in the batter and help the cakes bake more evenly. Beet powder creates the most glaze. 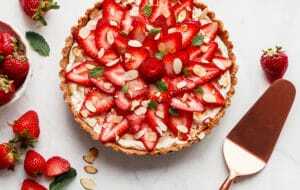 These look fantastic- I’m always here for small batch desserts. These are so cute! And I love that you went for a dessert that would work for any occasion, not just valentines day. I am not a huge fan of V-Day (all about the love, not all about the hallmark holiday), and these sound perfect. Really delicious, and not over-the-top with hearts and food coloring (beet powder for the win!). 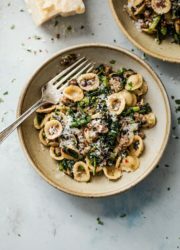 And I totally agree with you on scaled-down recipes that call for things like a TBSP of egg… this is so much better! I love the small batch concept & that glaze is absolutely gorgoeus! Omg, I love that stuff! I just realized that you can buy beet powder in larger containers and I’m going to get my hands on that stuff as soon as possible. Can’t wait to check out your post today! These are so gorgeous and bang on for Valentines Day. I am a total sucker for mini/small batch of desserts so these are perfect. Beautiful, Laura! I would love to try these little cakes. The glaze is beautiful! Gorgeous little cakes! Love that it is a small batch – although I’d like to eat cake all week, it’s usually better for both my health and my wallet to limit batch sizes sometimes!! Intrigued by the beet powder too – I haven’t seen it in Australia but will keep an eye out – it’s stunning. how cute are these cakes?! i actually have a similar recipe on my blog, but the cake base is lemon instead of almond and raspberry. but i love using beet as a food coloring, it makes such a beautiful, vibrant pink! too funny that the whole foods coloring was just beet powder in the end lol. I love mini cakes! Right after L’Academie, I worked at a restaurant where we used beet powder for food coloring. I completely forgot about it! Now I really want to try experimenting with it again. I love that these are naturally gluten-free. So vibrant, so fresh, Laura!